Yesterday we drove our first war. This war was against UTM. So we were ahead in the war. The end result after the first track was 5 - 2 for TRA. WE were winning! The second track went also very well. We were driving very good and we won again. With these results the total result become 10 - 4 for TRA. We owned UTM on their track and on our track. The third round didn't went very well. This was the round where the trouble begun. The server was laggy like hell and some players of TRA left or were kicked with no reason. We were still above UTM with points because the total result was 14 - 9 for TRA. The next track was Fullspeed vs. Tech 2. This track went extremely bad for TRA. We were owned..
Due to our lost on this track UTM immediately equalled the result. It was 15 - 15. The next track we tried to make the best out of it and we really want to win it. As you can see we on the picture above we just lost. This means the result was: 19 - 20 for UTM. UTM made a nice comeback. 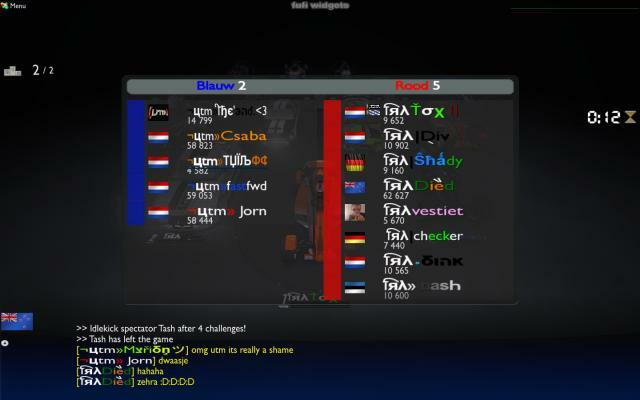 Maybe they also made this because the members of TRA were kicked constantly and Died couldn't race three tracks because the laggy server or because there were too many UTM players, so the server was full. The last track. We gave everything. But unfortunately it wasn't enough. We lost with 5 - 4 for UTM. This means that the total result came on 23 - 25. We last with two points. I don't have a screenshot of the result of the last track. I want to thank all the players that joined the war and I'm very proud on their performance. Unfortunately we lost. But I know this wasn't the fault of the TRA members that joined the clan. Maybe I will ask UTM soon if they want a revanche on our server. Then we will show the real skills of TRA on a server that works! I hope you all enjoyed the war despite of our loss. nice try guys and when is the revanche? We first have a war against TSCP on 30 or 31th of January and we have a war against DE. So I think at the end of February. It's a shame we lost by a difference of 2 points, but what I heard about their laggy server and TRA players getting kicked out all the time, still well done!. We shouldn't let this loss demotivate us as a clan because I know we got some great potential as a FS clan. I'am sorry I couldn't drive but I have a test week at school at the moment. Anyway we will own them next time. damn i have to agree again to blaze, lets hope i dont make it a habit! I can't agree more, really strange things happened on theire server. whezel wrote: damn i have to agree again to blaze, lets hope i dont make it a habit! pfft blaze if you wanna get more posts because you insult others go ahead^^ or fight me the fair way!